Since birds are the only surviving members of the family tree of the dinosaurs, why can’t we flip some switches in the genetic code and return a chicken back to its former glory as a dinosaur? Deep inside the dusty university store room, three scientists struggle to lift a huge fossilised bone. For many years, this chunky specimen has languished cryptically on a shelf. Now, with hammer and chisel poised, the academics from Montana State University in America gather round. They are about to shatter this rare vestige of the past. The answer is that they believe that this single fragment of a beast which stalked the earth untold millions of years ago could hold the key which will unlock the secrets of the dinosaurs. Extraordinarily, they contend that it could lead to a real life Jurassic Park, where dinosaurs are once again unleashed on the world by scientists. For just like in the hit Steven Spielberg movie, these men and women are intent on cracking the genetic code of the dinosaurs and opening the possibility of bringing them back to life. Their remarkable quest will be revealed in a TV documentary, Dinosaurs: Return To Life, to be screened tomorrow. It poses the question: will scientists ever be able to resurrect the dinosaur? According to Jack Horner, professor of palaeontology at Montana State University, the answer is an unequivocal yes. He says: ‘Of course we can bring them back to life. Their ancestral DNA is still present. So just how have these scientists arrived at the point where they believe they might unleash the mysteries of a prehistoric lost world? In order to understand their journey, we have to travel back a little less time — to 1992. This was when Raul Cano, professor of microbiology at California Polytechnic State University, made the first attempt to extract DNA from insects almost as old as the dinosaurs that had been embedded in amber, a sticky tree sap which hardens into transparent orange stone. Speculation about this possibility inspired the Jurassic Park story, in which an amber-trapped mosquito which sucked dinosaur blood unleashes its victims’ genetic code, allowing an obsessed billionaire to clone the species — with terrifying consequences. In his real-life laboratory, Cano cracked the amber open with freezing cold liquid nitrogen, obtaining a sample of the insect inside. Amazingly, he soon had a DNA sample from a 40 million-year-old bee. Soon afterwards, academics at the American Museum of Natural History recovered DNA from an ancient termite. 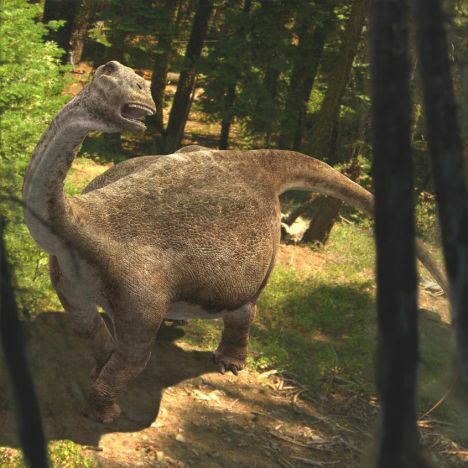 It seemed that dinosaur DNA could soon be within reach of modern-day scientists. But these early experiments ended in failure. The scientists could not replicate their results, leading to the suspicion that the tiny recovered fragments were actually contaminants, perhaps from the researchers’ hair or clothing. The search for ancient DNA in amber was abandoned, and it seemed that the door to the past remained closed. Since then however, researchers looking for prehistoric genetic fragments have managed to recover material from a 40,000-year-old mammoth, and from 45,000-year-old Neanderthal bones. But still there were doubts that dinosaur DNA could have survived. Then, in 2003, hopes were revived once again. Horner, who acted as an advisor on the Jurassic Park films, made a remarkable discovery while his team were excavating a 68 million-year-old Tyrannosaurus Rex skeleton in Montana. The site was so remote, the skeleton had to be removed by helicopter — the operation led to a huge thighbone splitting in two. Horner gave a piece of the bone to one of his students, palaeontologist Mary Schweitzer. Examining it, she noticed a strange structure inside the hard outer case. It resembled a pattern found only in the bones of pregnant birds. Puzzled, she asked her research assistant, Jennifer Wittmeyer, to dissolve the outer mineral layer. Six hours later, there was a knock on the door. ‘Jennifer ran into the room saying, “You’re not going to believe this,”’ recalls Schweitzer. ‘When she picked up a small piece, it stretched and moved all over the place. The magnitude of the discovery was immediately apparent to the Montana University team — the material appeared to be well preserved flesh from a Tyrannosaurus Rex. More extraordinary yet, was the next find in neighbouring parts of the dinosaur bone. ‘Out popped the blood vessels,’ says Schweitzer. Horner and his team knew that blood vessels should not exist in fossilised bone. Many scientists believed organic matter from a living thing could not survive more than 100,000 years — let alone 68 million years. Next came the team’s attempt to salvage DNA from other bones kept in the university storerooms. They put the samples they collected under a powerful microscope. Magnified 4,000 times, tiny structures unlikely to be mineralised fossil material were apparent. They seemed to be the microscopic cells that built dinosaur bones — called osteocytes. But Horner came to believe that his team needed to turn their work on its head if they were to unleash the dinosaur. Amazing as the discovery of ‘living’ dinosaur tissue was, he feared that constructing a complete DNA map from it would be a never ending task. So he embarked on a new strategy: retro-engineering a bird. 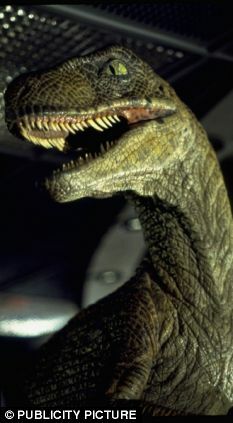 It is generally accepted by palaeontologists that birds are descended from a class of theropod dinosaurs called raptors. ‘If we want to see a dinosaur in our lifetime, we need to start with a bird and work backwards,’ says Horner. In the 1990s, scientists discovered dinosaurs in China buried in a fine ash. They were preserved in remarkable detail and bird-like features, including claws and feathers, were recognisable. 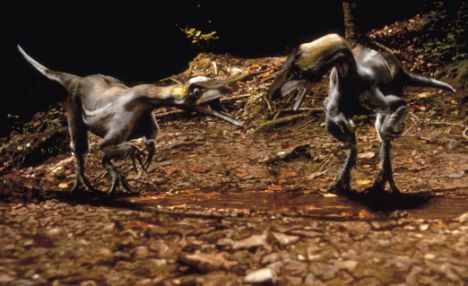 Horner believes that a modern bird’s DNA contains a genetic memory that could be ‘switched on’ again, resurrecting long-dormant dinosaur traits. To make such a creature, he would start with the genome (the whole hereditary information encoded in the DNA) of an emu. ‘Emus have all the features we need in order to make a Velociraptor-sized dinosaur,’ he says. Far-fetched as this sounds, his work is supported by other leading academics. Sean Carroll, a geneticist at the University of Wisconsin, says: ‘The inventory of genes in a bird would be very similar to the inventory of genes in a dinosaur. Expecting to see between four and eight vertebrae present in the developing spine, his microscope instead picked out 16 vertebrae — effectively a reptilian tail. As the embryo developed, the ‘tail’ became shorter and shorter, until the young bird hatched with only five vertebrae. Larsson says of the significance of the find: ‘For about 150 million years, this kind of a tail has never existed in birds. He wanted to see if he could make a chicken grow a dinosaur’s tail, turning the clock back millions of years. In 2005, Matt Harris and John Fallon, developmental biologists at the University of Wisconsin, noticed something strange while researching mutant chickens. Next, Harris and Fallon attempted to trigger the formation of teeth in a normal chicken, by injecting the embryo with a virus designed to ‘turn on’ the relevant gene. Examining the growing embryo two weeks later, he called colleagues to look at what had happened. ‘You could see very clearly paired structures on the lower jaw. Following this, Harris and Fallon began to find other dinosaur traits in the DNA of birds, such as scales. They looked at an ancient Chinese breed of chicken called a Silkie. It has primitive plumage similar to that believed to grow on some dinosaurs. By activating a dormant gene, Harris and Fallon attempted to ‘trick’ the chicken’s leg into growing feathers instead of scales. It worked — they had uncovered the genetic changes that had taken place as the dinosaur evolved into a bird. Meanwhile, in Canada, Larsson had found that the three-fingered dinosaur claw structure remains hidden within a bird’s wing to this day. ‘The dinosaur fingers are adapted for grasping and snatching prey,’ he explains. With further research, he believes scientists should be able to transform a bird’s wing back into a dinosaur arm. So, will it one day be possible to reverse evolution? Mark Westhusin is a world-renowned expert in creating life forms from DNA. Together with his colleague, Dewey Kramer, at Texas A&M University, he has cloned more species than researchers at any other laboratory, including a White-tailed deer and a Black Angus bull. 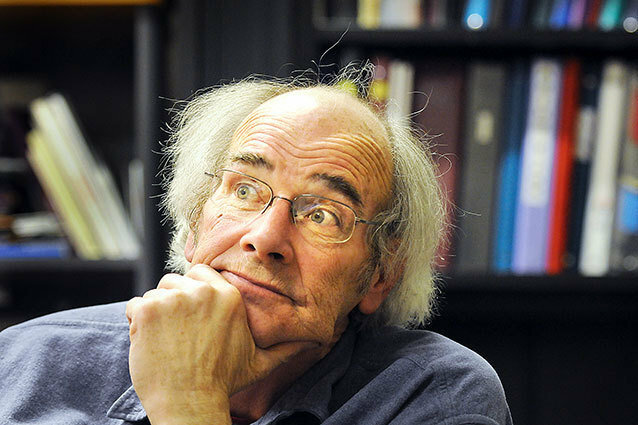 Westhusin explains that soon, the relevant DNA to turn back the clock could be manufactured and implanted into an emu egg, for instance, to trigger dormant genes. ‘We already have small artificial chromosomes that have been put into embryos and develop and divide and express their genes,’ he explains. Larsson now believes that in a hundred years or so, geneticists could retro-engineer animals that appear identical to Mesozoic dinosaurs. ‘Why can’t we take all the genetics, just change it around a little bit, and produce a Tyrannosaurus Rex, or something that looks like one?’ he asks. Fallon agrees, saying: ‘As we learn more, we’ll be able to do it. For his part, Horner imagines creating the first example. ‘I have to admit that I’ve certainly imagined walking up on a stage to give a talk, and having a little dino chicken walk up behind me,’ he says. ‘That would be kind of cool. ‘There is now nothing to stop us bringing back dinosaurs but ourselves. Big Question for 2012: Will We Create a Dinosaur From a Chicken? 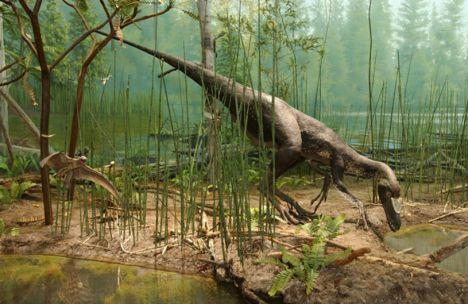 Could 2012 be the year of Chickenosaurus, the first dinosaur to live in modern times? You might recall our story from a few years ago, describing what was then referred to as “Dinochicken.” To recap, Jack Horner, curator of paleontology at the Museum of the Rockies, told me that he and some colleagues were working to create a dinosaur out of a chicken. The goal is to bring back multiple dinosaur characteristics, such as a tail, teeth and forearms, by changing the levels of regulatory proteins that have evolved to suppress these characteristics in modern birds. The timing of this announcement coincided with the release of Horner’s book, How To Build a Dinosaur: Extinction Doesn’t Have To Be Forever (Dutton Adult, 2009). He suggested to me then that he and some colleagues, such as Hans Larsson of McGill University in Montreal, were already moving forward with the project. So how far ahead are they with the project now? Horner isn’t revealing, but he continues to share that he and his colleagues are actively working on the needed steps. I think he wants the result to be complete, and not just a chicken with a dino-like tail, for example. So after shooting on the film wrapped, Horner — along with some ambitious graduate students — got to work on recreating a dinosaur. They tried extracting DNA from a Tyrannosaurus Rex specimin, but that turned out to be as helpful as hiding from a Tyrannosaurus Rex in a flimsy bathroom. 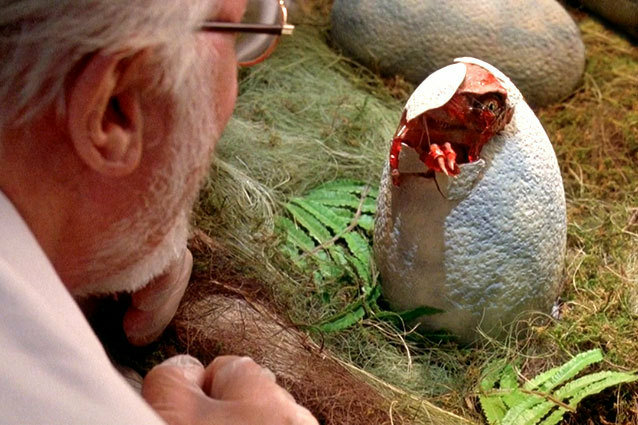 Instead, almost two decades after Spielberg’s classic screened in theaters, Horner realized the easiest way to bring dinosaurs back to life was to create a dino-chicken. And if you’re thinking that sounds like a chicken that’s been retrofitted to look like a dinosaur, you’d be exactly right. Like 2014’s Jurassic Park IV, which has once again recruited Horner as an adviser. And though the paleontologist is remaining mum about the film’s plot details (“It’s going to be a scary movie,” is all he’ll say), perhaps the dinosaurs will look a bit different this time around. After all, in the past 20 years, paleontologists have confirmed that the prehistoric animals were much more plumed than we previously thought. And perhaps if dino-chickens find their way into the spotlight soon, Jurassic Park IV producer Spielberg won’t need to find actors after all.